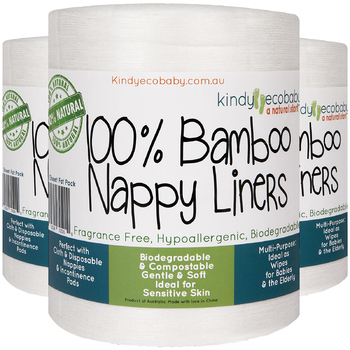 Kindy Ecobaby Bamboo Nappy Liners 200 Sheet Pack are fully flushable, compostable, and 100 per cent biodegradable. Each roll consists of 100 sheets, perforated between sheets to make your life easier during nappy changes when you have your hands full and you need a nappy liner sheet fast! Each sheet is 15X30cm, the perfect size to fit snuggly on top of your baby's nappy insert (or disposable nappy) and protect her soft skin! Our bamboo nappy liners are soft, strong, fragrance free and chemical free, and make nappy changes so much easier and mess-free! 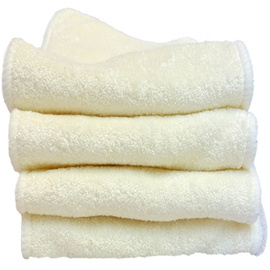 KindyNews Ecobaby Bamboo Nappy liners also have natural antibacterial qualities and can be used with modern cloth nappies or disposable nappies. With you and your needs in mind, we have put many hours of time and effort sourcing our bamboo nappy liners and other products for our eco store to ensure they are of top quality and only the best for you - our valued customers - while still making them affordable for you. 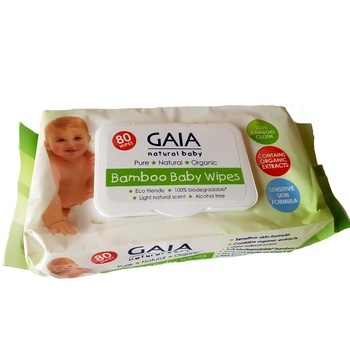 Be confident you are buying the best quality bamboo nappy liners on the market! Sheet Thickness: 160gsm - strong and durable!